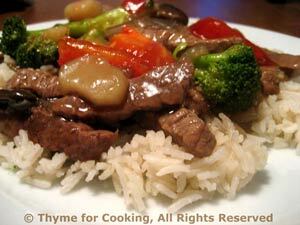 Thyme for Cooking Dinner tonight: Stir-Fried Beef and Broccoli. This is one of the first dishes I made when I started stir-frying and it's always been a favorite. Winter-hard tomatoes are perfect for it! I served it on fluffy, white Basmati for a change from my usual Brown Rice. The pepper is left from last week. Heat olive oil in large nonstick skillet over medium-high heat. Add onion, pepper and celery to skillet and stir-fry for 2 minutes.